I use a 11" x 17" 100 lb. Accent Opaque Digital bristol board with a smooth finish. I buy this in large packs at Arvey or Xpedx. This laminated template gives me a rough guide for placing the panels. I made the template so I wouldn’t have to measure every time. 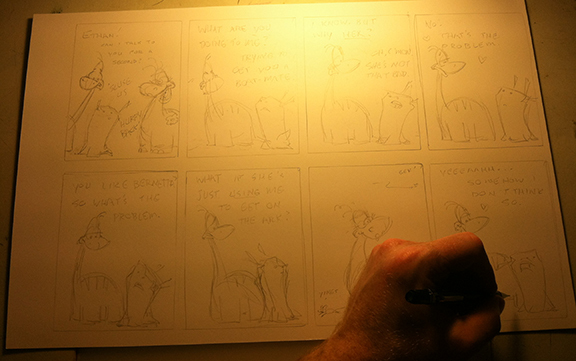 I sketch in the cartoons and concept dialogue with a 0.5mm mechanical pencil. I don’t usually render the drawings any more than this since the characters are pretty simple and familiar to me. 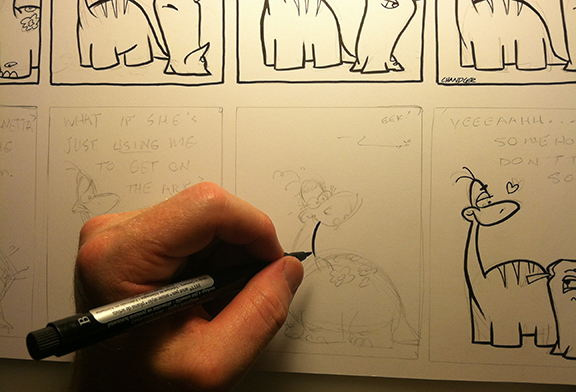 Inking the cartoons and letters with a variety of pens, including brush markers, Sharpies, Rollerball, and felt-tip pens. And "yes", I ink from right to left since I am left-handed. 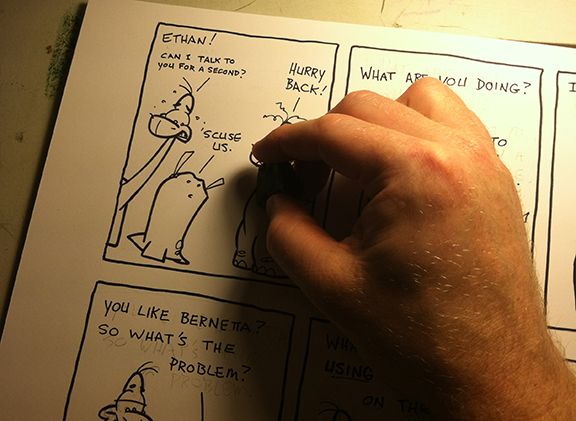 Older classic Moth & Ethan strips were inked with brush and India ink. Brush markers, while less sophisticated or opaque, are also not as messy. Quick clean-up with kneaded artist erasers. 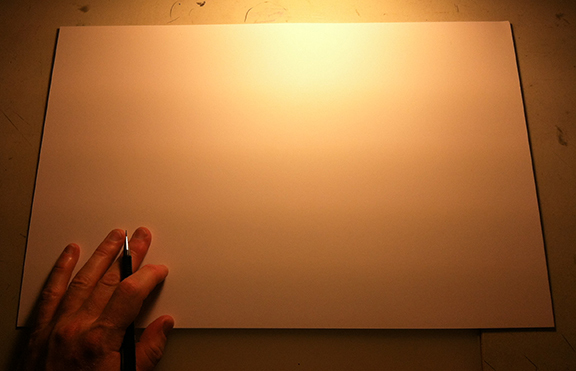 Some artists avoid this kind of clean-up by inking over a light table on a separate sheet, or just inking digitally. 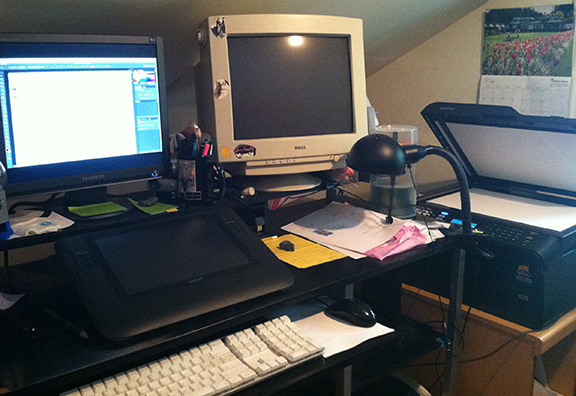 Move from the drawing table to the computer workstation. I am currently running a new generation Mac Mini, to which I’ve connected a 12″ Wacom Cintiq, and new Brother large-format scanner, both of which are tremendous time-savers. Scan the inked drawings at 300dpi in Black & White. 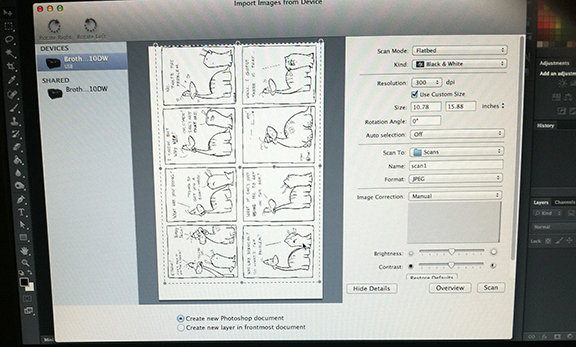 Black & White or Greyscale images scan faster and make it easier to adjust the levels. 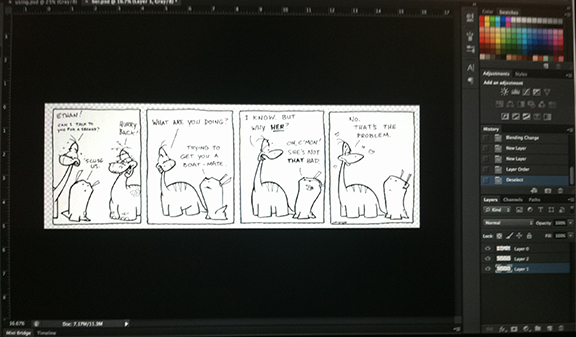 I crop and rotate the scanned images in Photoshop, then save them as memorable PSD files. The Brightness & Contrast usually has to be adjusted. I also change the flat Background to a Layer and set it to Multiply. After that, I convert the image from Greyscale to RGB, and add two more layers beneath that line layer. This is also the point where I digitally clean up the inks and fix mistakes or make changes – a common occurrence.. Finally, I add the background and foreground colors on the separate layers, and Merge the Visible Layers together before saving the PNG file at a reasonable screen resolution. Selection tools, Paint Bucket, and Brushes are all used to fill in the colors. I also have a color palette specifically for Moth & Ethan and a few of the other characters. That’s about it! Hope you weren’t too bored and I hope it doesn’t take away the “magic”. Feel free to ask more detailed questions via e-mail or in the comments section below. Andrew, I really like your process. 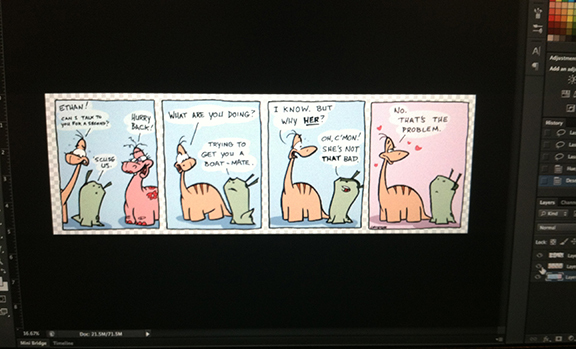 My method is very similar to you and I’m currently working on a strip that I hope to get up and running on my Blog. If you get some free time please check out my website. Keep up the great work and all the best. Thank you,sir. We appreciate you stopping by, and for your kind words! 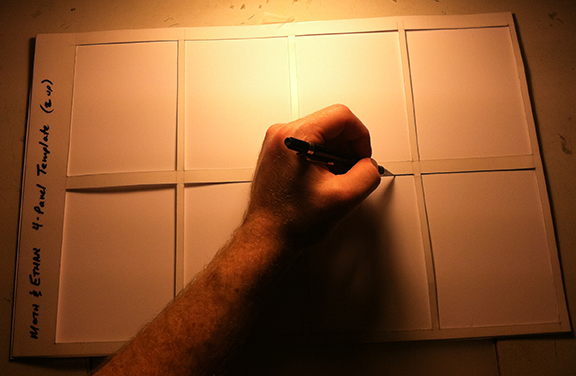 I love getting a sneak peek at a comic artist’s methods! I thoroughly enjoyed this post! Nah, just kidding! If anything, this has only enhanced the magic. Thanks for sharing your process with us. David, I normally use a color laser version for my everyday print needs, but the Brother MFC-J6710WD all-in-one is an ink jet and it seems to work pretty well as my backup printer.